Ideally located in the medina, 300 meters from the famous Jemâa el Fna Square, in the Derb Dabachi district. Leaving the busy square, you will enter a quiet alley, well kept and supervised. 200 m from all shops, taxis, carriages, cybercafés, restaurants and souks. The animations of the place Jemâa el Fna are at 3 minutes on foot. You will also easily radiate to all the monuments and entertainment of the Red City from the Riad. A deposit of 500 € will be requested upon arrival and returned after inventory by our butler. Lovely, peaceful respite from bustle of market. This place was amazing! Three bedrooms, each with its own bathroom and storage closets. The kitchen facilities are totally adequate. This place truly reflects the loveliness of Moroccan culture. 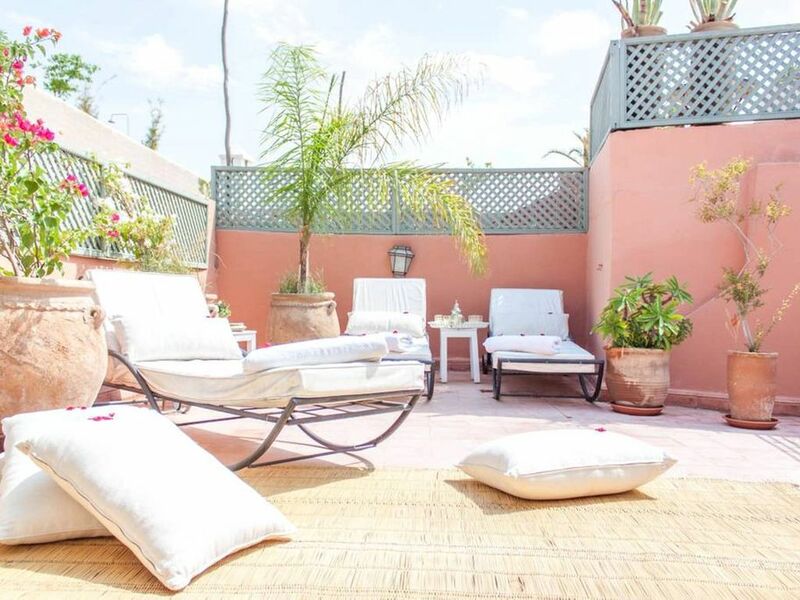 The roof patio was my favorite place in Marrakech! The caretaker was helpful, kind and honest. I recommend this riad completely. We recommend the place Djema el Fna at night with its typical atmosphere and its small restaurants at very low prices! The Majorelle garden and the inevitable Yves St Laurent Museum, simply magnificent. Visit the spice square a few hundred meters from the famous square.